Based on Ray Bradbury's classic sci-fi novel of the same name, the thought-provoking parable depicts a frighteningly plausible future where media is an opiate, history is purged and dissent is outlawed. The dystopian thriller centers on Montag (Jordan), a young fireman who forsakes his world and struggles to regain his humanity as he battles his mentor, fire captain Beatty (Shannon). 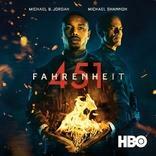 Special Features:Behind the Fire - Take a deeper look into Fahrenheit 451 as Michael B. Jordan, Michael Shannon, Sofia Boutella, and director Ramin Bahrani discuss Guy Montag's character evolution and relationships.